My sincere thanks go out to everyone who voted for the blog in the CBS Philadelphia Most Valuable Blogger competition. I learned on Wednesday that Gluten Free Philly won the People's Choice Award in the Health, Fitness and Medical category. As I wrote on Tuesday, Davio's, the Northern Italian steakhouse near Rittenhouse Square in Center City Philadelphia, will be hosting a gluten-free beer dinner on Tuesday, October 11. The featured drinks on the menu are Redbridge beer and two kinds of Magners cider. The cost is $50, exclusive of tax and gratuity. Reservations are being taken at the restaurant over the phone at 215-563-4810. We'll start in Delaware with this week's restaurant information. New reader Don L. let me know that longtime Wilmington staple Kid Shelleen's (1801 W. 14th St., 302-658-4600) offers a gluten-free menu. Moving north to Mercer County, New Jersey, Princeton Soup & Sandwich (30 Palmer Square E., 609-497-0008) rotates a selection of more than 30 gluten-free soups, with two or three offered daily. The shop also has Boar's Head hot dogs and salads. Falls Taproom in Philly's East Falls section (3749 Midvale Ave., 215-849-1222) is serving Revolution Cider. 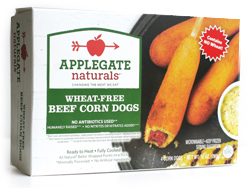 Available exclusively at Whole Foods are all-natural gluten-free beef corn dogs from Applegate Farms. The batter is made of a blend of corn meal, corn flour and rice flour. GoPicnic ready-to-eat meals are now sold at local Wegmans markets, The Fresh Market stores in Pennsylvania, and even at Philadelphia International Airport (at the CNBC and Hudson News shops). A searchable list of locations by zip code is available at the company's website. COOK (253 S. 20th St., 215-735-COOK) is a fully-equipped, 16-seat kitchen-classroom where guests can enjoy meals made by Philadelphia-area culinary professionals. On Saturday, October 22 at noon, "Gluten-Free Warrior" Genevieve Sherrow will lead a class on creating a gluten-free brunch menu. Her class menu will include Nutty Millet Porridge with seasonal fruit, Hearty Buckwheat Waffles, Scallion, Cashew and Nori Egg Scramble. The class costs $75 and online registration is available. Yay!! Congratulations!! And thanks for all the great info. I look forward to trying some new places the next time I visit my family.